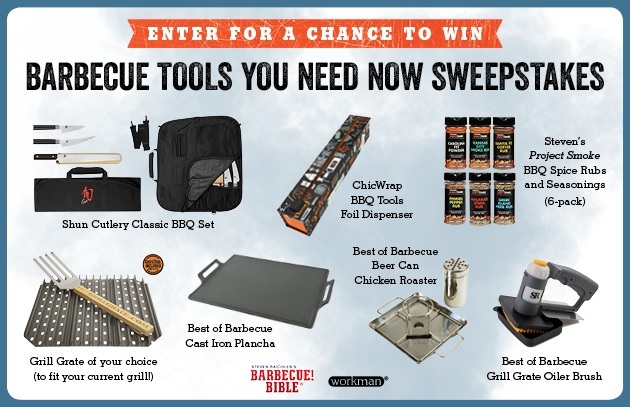 This summer we are bringing you the ultimate grilling essentials sweepstakes—whether you are a beginner looking to launch your grilling career in style or an experienced griller keen on expanding your summer entertaining repertoire, these tools will get you there. These convenient tools will make you look like a pro, from ultra-sharp knives from Shun Cutlery to the hassle-free ChicWrap Foil Dispenser, and expand the ways you can use your grill, from the genius raised rail Grill Grate to the inventive Beer Can Roaster. No matter what your protein of choice, this sweepstakes includes the knives, rubs, and tools you need. NO PURCHASE NECESSARY. Open to US residents of the 48 Continental United States, age 18 years as of August 21, 2017. Sweepstakes begins at 12:00 a.m. Eastern Time (ET) on 7/21/2017 and ends at 11:59 p.m. ET on 8/21/2017. Click here for official rules. Void where prohibited.